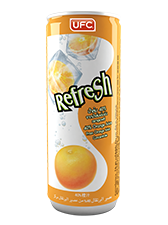 Refresh Orange juice are produce from cautiously selected Tangerine and Valencia oranges. Tangerines are very low in calories, high in Vitamin C and anti-oxidants; while Valencia oranges are sweet and have heavy texture. The two combine makes a great sweet and sour fusion. Refresh Orange juice are also filled with pulps and sacs in order to strengthen the flavours and texture as well as retain more health benefits.